One interesting and useful new feature in SQL Server 2017 is Automatic plan correction. This feature relies on having Query Store enabled for your database. It will look for query plan choice regressions where there has been a significant regression based on CPU time for a given query. This feature essentially automates the usage of sp_query_store_force_plan for CPU-related plan regressions. Microsoft has more details about automatic tuning here. One important detail that isn’t easy to find about automatic plan correction is whether it is available in SQL Server 2017 Standard Edition or not. We can easily confirm whether it is Enterprise-only feature with a simple test. You can do this by trying to enable the feature on a SQL Server 2017 Standard Edition instance, and see what happens. 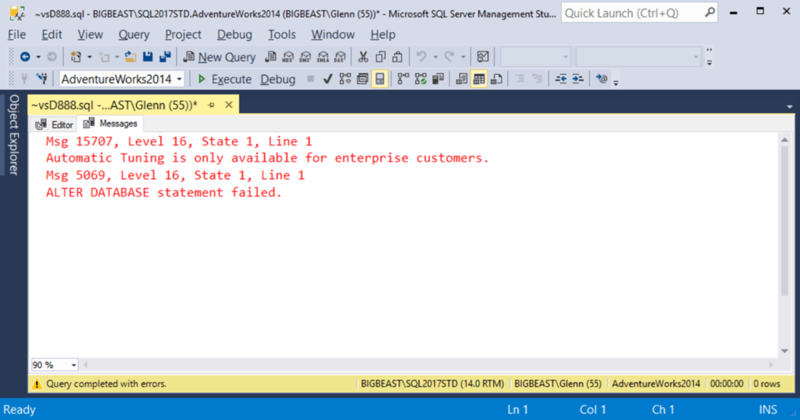 You use the T-SQL shown in Figure 1 to enable automatic plan correction for the current database. As it turns out, this feature is not available unless you are using SQL Server 2017 Enterprise Edition, as you can see in Figure 2. This is another reason that you should prefer Enterprise Edition if your budget allows it. Yo can learn more about this feature by watching Erin Stellato’s Pluralsight course, SQL Server: Automatic Tuning in SQL Server 2017 and Azure SQL Database. You can also read her article on SQLPerformance.com, which is Automatic Plan Correction in SQL Server. Intel formally announced its 9th generation Core mainstream desktop processors on October 8, 2018 at its Fall Launch Event in New York. So far, Intel has announced three members of this new Intel desktop processor family. The prices below are the MSRP prices. Actual street prices are a currently little higher, especially for the Core i9-9900K. Supply is also a little tight so far. 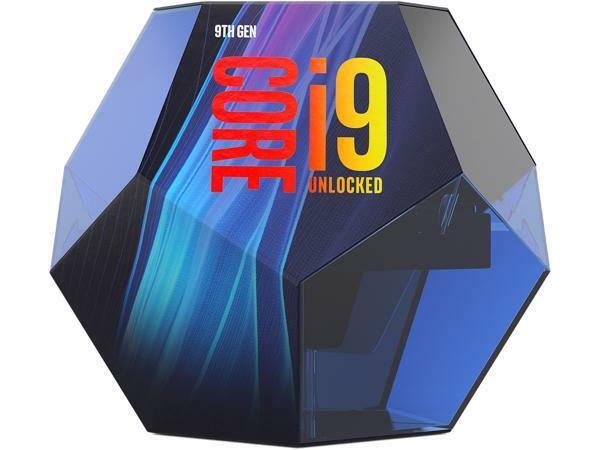 First, the Core i9-9900K has a base clock speed of 3.60 GHz, a Turbo clock speed of 5.0 GHz, and 16MB of L3 cache. Next, the Core i7-9700K has a base clock speed of 3.60 GHz, a Turbo clock speed of 4.9 GHz, and 12MB of L3 cache. Finally, the Core i5-9600K has a base clock speed of 3.70 GHz, a Turbo clock speed of 4.6 GHz, and 9MB of L3 cache. All of these processors are aimed at gaming and general desktop usage. They are competitors to AMD’s Ryzen 2xxx mainstream desktop processors. You may have noticed that Intel has dropped hyper-threading (HT) from the Core i7 line. This was is something the Core i7 has always had, and it was one of the main differentiators over the Core i5 line in the past. The lack of HT means a loss of about 25-30% of your overall CPU capacity when you have the same number of physical cores. All of these new Intel processors have soldered thermal interface material (rather than thermal paste) which will help with heat dissipation. This will let them run more cores at slightly higher (100-200MHz) clock speeds more often. These processors also have hardware-level mitigation for some of the Meltdown CPU exploits. This will give better performance than software or firmware mitigations. These new processors will all work in existing Intel 300 series chipsets (with an updated BIOS). Intel is also introducing a new Z390 chipset, which is a very slight improvement over the previous Z370 chipset, primarily with native USB 3.1 Gen 2 support and built-in 802.11ac Wi-Fi support. Here is the list of Z390 motherboards from NewEgg, while AnandTech has a roundup of Z390 motherboards here. Intel also announced a new generation of high-end desktop (HEDT) processors, which are the Core X-Series processors. The HEDT processors use the LGA2066 socket on X299 motherboards. There are seven SKUs in this family. These processors are designed to compete with the AMD Ryzen Threadripper HEDT processors. Unlike previous generation Intel HEDT processors, every one of the SKUs in this family support 48 PCIe 3.0 lanes.